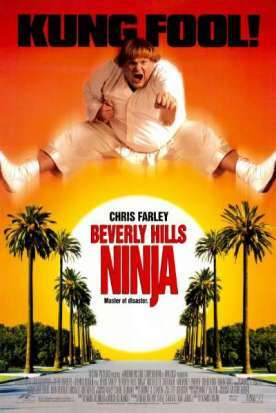 Beverly Hills Ninja by Dennis Dugan tries yet again to make Chris Farley’s brand of physical comedy, which consists of smashing into things and roaring, funny—but with no more success than Black Sheep or Tommy Boy. Artistic, or comedic, success I mean. At the box office it is boffo. For some reason, Americans in the nineties are suckers for the Dumb and Dumber formula, and yet another film seems to have made money by pandering to that strange craving. Well, what do you expect from this overgrown kid stuff? As Haru is leaving the dojo, he tells the Sensei: “There is no better father a boy could have had.” Also, his “Ninja intuition” about the beauteous Miss Sheridan proves correct in the end, even though the wise old Sensei has told him that “you are being led around by your short sword.” When, at this point, Haru says that “My Ninja intuition tells me” that the girl is sincere, the Sensei replies: “You do not have Ninja intuition; you do not even have normal intuition.” But he is wrong. Clumsy, uncoordinated, untrained, undisciplined morons are not only lucky, but also perspicacious. After decades of dumbing down, that is what we just love to believe.